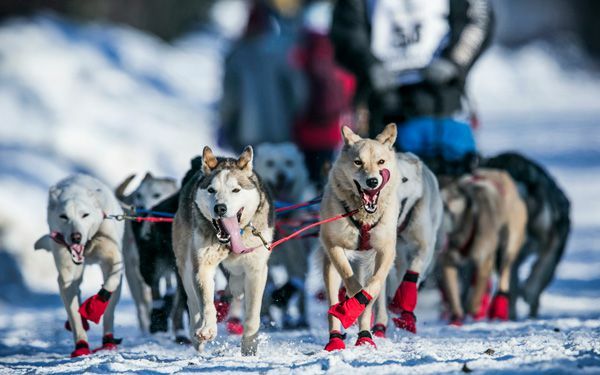 Much of the start of the world's most famous sled dog race is covered in barren gravel, forcing Iditarod organizers to move the start further north where there is snow and ice. A weather pattern that buried the eastern U.S. in snow has left Alaska fairly warm and relatively snow-free this winter, especially south of the Alaska Range. 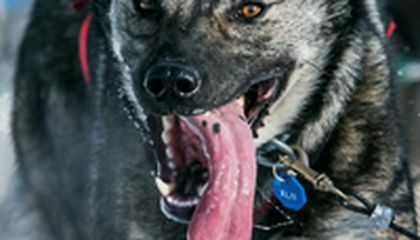 The Iditarod Trail Sled Dog Race started Saturday, March 7 with a ceremonial run through Anchorage, Alaska. But the official start that was two days later was moved 225 miles north, over the Alaska Range, to Fairbanks to avoid the area that left many mushers bruised and bloodied last year. Iditarod officials said the conditions are worse this year. The race's chief executive officer, Stan Hooley, called the conditions "pretty miserable." And last year was no picnic. One musher last year was taken out by a rescue helicopter after making it through the Dalzell Gorge only to hit his head on a tree stump in the Farewell Burn. Knocked unconscious for at least an hour, Scott Janssen got back on the trail after waking up. But shortly after, he broke his ankle while walking on ice trying to corral a loose dog. This year's race features 78 mushers, including six former champions and 20 rookies. The winner is expected in Nome in about 10 days. Alaskans can thank the jet stream, which has been delivering warm air from the Pacific, said Dave Snider, a meteorologist with the National Weather Service in Anchorage. "That position of the jet has been pretty stagnant, or at least in the general same position for a long period of time. While that's allowing a lot of cold air to flow out of the Arctic into the Midwest and the eastern seaboard, we're locked into the warmer part of that pattern, and we've continued to see those warm pushes for a fairly long period over the winter," he said. Anchorage gets about 60 inches of snow in a normal year; this year only about 20 inches have fallen. Brent Sass of Eureka, Alaska, is running his third Iditarod, and is coming off a win in last month's 1,000-mile Yukon Quest International Sled Dog Race. "It doesn't hurt a guy like me who has only run the race a couple of times," he said of the route change. "For the guys that have run the race 20 times, it's not just the normal routine so it might throw them off a little bit." Among the veterans in this year's race is the defending champion, Dallas Seavey, and the 2014 bizarre finish will be remembered as much as the poor trail conditions. A sudden blizzard blew four-time champion and race leader Jeff King out of the race when he was about 25 miles from the finish line of the nearly 1,000-mile race. Then Aliy Zirkle, who was solidly in second place, waited out the storm at the last checkpoint, 22 miles from Nome, for two hours, 38 minutes. She got back on the trail when Seavey blew through the checkpoint, but lost the race by two minutes, 22 seconds. It was her third straight runner-up finish with no wins. The route change eliminates the mountainous terrain and treacherous gorge, but it could present mushers with a whole new set of problems with a flat trail on unpredictable river ice. Plus, because it's an entirely new route, mushers say they can't rely much on information, even something as simple as the mileage between village checkpoints, provided by Iditarod officials. "Just because it's a flat trail does not mean your dogs can all of a sudden do 10 times what they've been able to do in the past," said Seavey, a two-time champion. "I feel that is a trap that will catch a lot of people." I personally feel really bad for the dogs that are pushed into being apart of this sport. I am sure that it is very intense and that they are forced into doing this. Unfortunately, they do not get a say in what they participate in. This years race is a whole new ballgame, because it is a new trail the nobody knows. After doing the race after so many years people wont know what they will come across on this new trail. It will be a new experience for everyone, even the racers with the most skill. Also the race will be 600 miles across a frozen rivers. this will be like no other race before. The trail is being moved because of how little of snow that the old trail has. This new trail will make a big difference in the race. what makes this a new ballgame is the new trail you cant trust any information that someone gives you. even though the path is flat then your dog might have a harder time running the trail. Their is no way of knowing the trail because no one has raced this trail be for. People believe that this race will be faster then any eny time of this race has every seen because of how flat the trail is. I believe that it be dangerous to do the race spence the racer are use to to old one and now the new one can be more danger and racers can disappear. Having a different area to race will definitely make it more exciting but also more challenging. Its exciting because its a different place for the dogs and it would be fun to see ow they react to somewhere different to race. Its challenging because the people controlling the dogs are not nearly as familiar with the layout of the land and may end up being lost. Personally I am very excited about the Iditarod. Lots of people do not like the Iditarod because some times dogs can't always handle the weather and pass away. The reason I like the "last great race on earth" is because usually the musher always takes care of there dog before themselves. There is also a website called Iditarod-Last Great Race on Earth, where you can pick a musher and track them as they race. I think that is really cool I like dogs and I think it is cool because it is the first dog to ever be the champion of sledding 22 miles and be the first dog to win just that far I think that is cool. I think that the north push of the start of the race is a great idea. The mushers need snow or else they'd attach wheels to the bottom of their sleds. I think that this change will help both mushers and dogs. Plus if you have the mushers run the way from Anchorage to the new start they'll be ready.